The first four episodes of Puella Magi Madoka Magica, a series whose trailers gave no hint at the harrowing emotional rollercoaster to come, ramp up the darkness quickly. By now it is clear that it is not merely a matter of the gothic, Kajiura/Shinbo-fueled atmospherics at play: there is something there there, a theme that is explored in record time by the standards of anime. In question is what drives the desire to be a hero(ine). That is what a magical girl is at root, a heroine who is given power to rescue people from danger: from witches and demons both external and (it is strongly hinted) internal. The best hero stories resonate on both of those levels, where the monstrous, surreal “witches” are increasingly seen as both the reflection and the product of the darkest human emotions: despair, anger, grief. The witch cores are not called “Grief Seeds” for nothing. One by one, the underpinnings of this setup are questioned. What is the source of a magical girl’s power? A contract with an adorable familiar, of course—but why is it assumed that he or she is good? Why does an ordinary girl want to sign such a contract? To be helpful and to be a good person, of course—but is that desire to help really altrusitic, or is it driven by her own inner pain and demons? Earlier, Mami draws the deeply true insight that there is a difference in carrying out another person’s desire for well-being vs. wishing for someone else’s well-being for your own sake. The line, in real life, is very blurry, because it is mixed up with love and loneliness and need and concern. It is hard because it is not exactly the line between good and evil so much as the line between what is genuinely best for another vs what one thinks is best. It is a realm where selfishness can look like selflessness, and the heart is deceitful above all things. This is the harsh, poignant dilemma that Kyubei, the contract-making familiar, plays upon. The one wish that becoming a magical girl grants is not tempting to any of the girls for the sake of power, wealth, popularity, or other obviously selfish goals. For Mami, it was merely to stay alive. For Sayaka, it is to restore the health of her cripped friend. Madoka has not yet discovered her reason, but given the pain and grief that seem to drive the other girls’ decisions, she will find one soon enough. Everyone does: everyone knows what it is like to be faced with terrible things happening to a family member, or to a friend, and wishing you could do something about it but feeling helpless and unable to do anything. You want to be a hero. A savior and a messiah. But can you? The price of carrying out that desire can be, as this show is demonstrating, absolutely terrible. Worse, it can be futile. Mami’s death could have been portrayed as heroic. It could have been in the tradition of the deaths of Kamina and Roy Fokker and Obi-wan Kenobi, the sacrificial gesture that prods the protagonist-hero to greater achievement and determination. The reason why episode 3 was so shocking was that Shinbo and Urobuchi completely undermine this template of grand heroic martyrdom. Mami’s death is sudden, surprising, and brutal. There is no drawn out music, only shock. She not only dies, she fails, and rescue only comes from someone else. She contracted with Kyubei to save her life, only to lose it again in an unseen, forgotten alternate world; to everyone else, she has merely disappeared. It is, in short, the worst fate imaginable, and it was for naught—she didn’t save anyone in the process. She was merely destroyed. “This is what it means to be a magical girl,” Homura pronounces, taking no joy in her victory. Who would want this? What would drive a person, knowing that this could happen, to contract with Kyubei? 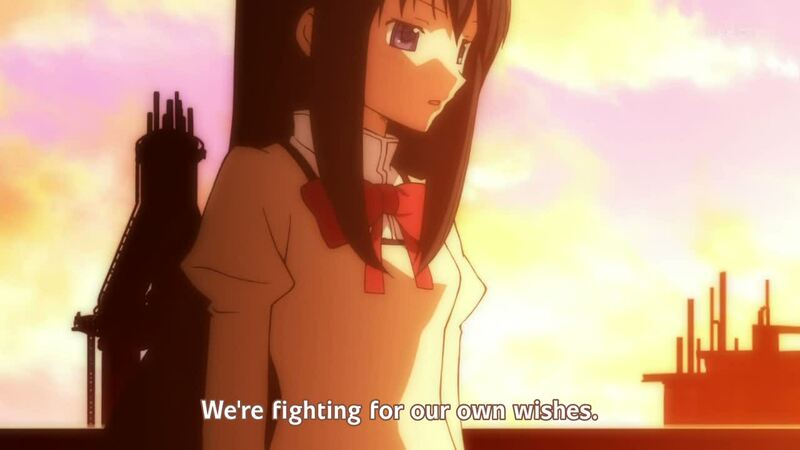 Someone who simply desires to do good, as Madoka does, who feels talentless and useless otherwise. Or, far more poignantly, someone who loves—as Sayaka does—and would do anything for her love to make him whole and happy again. That love is what overcomes the horror of Mami’s reality, of the increasingly dark deal that Kyubei offers. The possibility that maybe, just maybe, the price would be worth it. But there is no guarantee. And that drives the terror and the pathos at the heart of this show, and is what is making it the most emotionally compelling and moving show this winter. It could do for the magical girl genre what Evangelion did for giant robots. I can’t wait to see what happens next. Previous PostWinter 2011 Season: Audio Impressions!Next Post3-D must be crazy. Part 1: War On Skinship. I think we’ll soon see whether or not Sayaka’s wish for Kamijou will actually be worth it or, like Mami’s talk about wishes in the previous episodes, it will be for naught, leaving the poor girl stuck in a (short and brutal) life fighting *things* she’ll never ever be thanked for. As for Madoka, well, I can’t say I blame her hesitation — she’s both grieving AND scared out of her wits. Makes me wonder what the final push would be for her to become a Magical Girl, especially with Homura revealing more of what she knows about being one. Oh, and then there’s the new arrival, who doesn’t seem like a nice person at first glance. Will likely have words to share on this soon. Great piece that helped make me more curious. I reeaaally want to like this show, but alas….The skeleton is feeling rather chilly underneath all that flash n color. Perhaps an upcoming short post will explain? This show sounds very interesting, I can’t wait to check it out! Anyone have any animes like this one that they want suggest for me? I’d love to hear it! I watched epi 3. Very shocking! A sage girl got killed. And by the enemy that didn’t look tough at all. But this show is heavy from the start. Crippled friend is like a million dollar baby situation. Without magic or miracle, we don’t know what to do. It’s tough. Mami’s insight. Do unto others as they would have you do unto them. vs. Do unto others as you would have them do unto you. 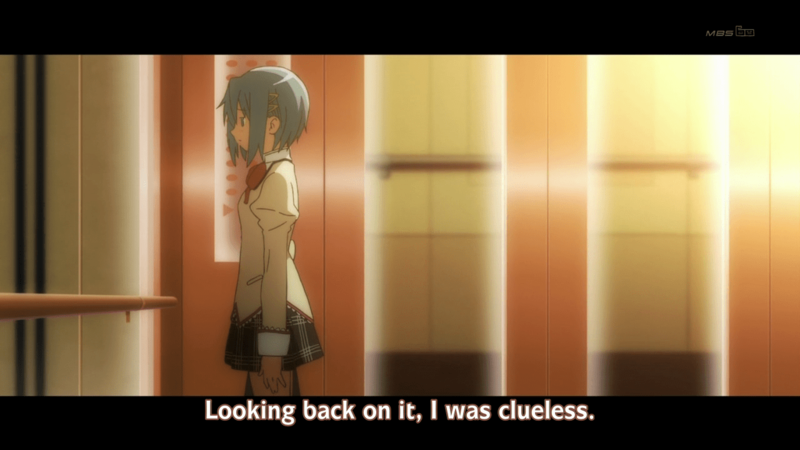 Very deep for magical girl anime. I think I’ll continue watch this anime. Motivation and selfishness are common themes in anime, but it’s usually not handled all that well. Have you ever read The Quiet American? It, too, is all about how a naive desire to do good can lead one to commit acts of evil. The recent episodes of Madoka have been very interesting. I think that the reason that Madoka has the capacity to become the ultimate witch is that she is not, in fact, that naive. She’s portrayed as having a pure, absolute love for those around her that normal humans are incapable of, making her wish and her powers stronger, just as Sayaka’s love (though her wish was ultimately selfish and this selfishness led to her downfall) made her stronger through her healing factor.